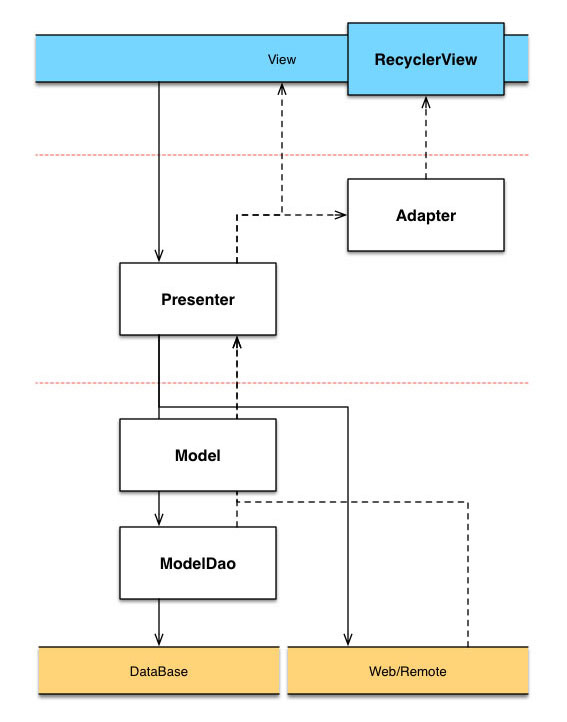 As we can see, Presenter part acts as two roles: manipulates data with ModelDao and displays data to View. Coding often becomes trivial when we implementing the displaying part and complicated when we updating different views with the same data source. Taking an Excel app for example, displaying all the records requires code like EditText.setText() to bind data with a RecyclerView. Also modifying record requires code to find that specific record in RecyclerView or the corresponding record in detail view, and update them. We can skip EditText.setText() part by taking the advantage of Google’s Data Binding library. But what if we go further and more aggressive and directly bind Database with view through some way, then all the Presenter has to do is updating the Database. Presenter doesn’t need to care when the record is changed or which one of record is changed. That is where the DroidData based on. DroidData uses Data Binding(bind data to view), ContentProvider(a native android library providing mechanisms to query data and notify data changes), GreenDao(a light & fast ORM solution for manipulating data in SQLite Databases) to accomplish above goal. All the notifications are triggered by the native ContentProvider.Also, DroidData provides a DDCursorRecyclerAdapter to bind database with view by Cursor, and ModelObservable map is stored with WeakReference. 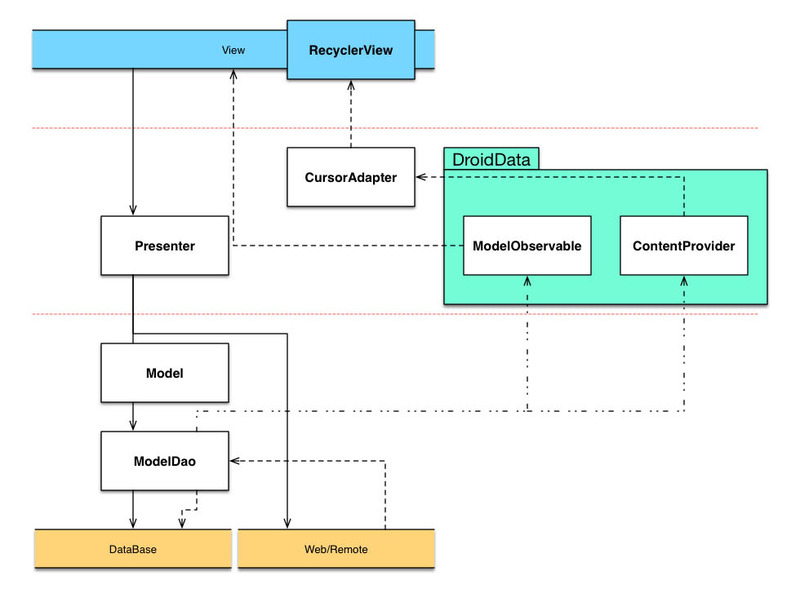 It seems that DroidData violated the MV* pattern to some extent, because we connect View and Model directly. From another point of view, we actually connect View with ContentProvider which can also be considered as Presenter. Furthermore, DroidData makes test more straightforward. We can test the Presenter without the View.